The second flagship store for the world’s number 1 makeup artist opened its doors to customers in October 2016. With a career in the makeup industry expanding 25 years and the success of her first store in Covent Garden, the makeup artist's second store needed to offer customers something new to their experience. 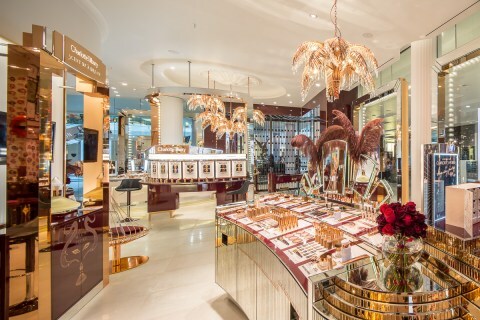 The glamour of the old Hollywood-inspired theme is evident in every detail of the store; from the crimson-red velvet sofas and doors, to the elaborate, rose-gold light fittings which depict those that would have been installed in theatres during the roaring 1920s. The vintage style is beautifully juxtaposed with state-of-the-art digital innovations that come in the form of an interactive ‘Magic Mirror’ installation, where customers can stand in front of a screen and choose pre-programmed makeup looks to be superimposed on their faces. Air Diffusion worked with contractors Morris Mellett to design the air distribution systems that would be used and Air Diffusion provided the store with two of its ventilation products. The innovative and chic design of Air Diffusion’s FlowBar high capacity slot diffusers have been installed in the store and complement the virtual reality system whilst also integrating seamlessly with the store’s Hollywood-style charm. FlowBar was chosen for its discreet appearance to run along the ceiling and emphasize the sparkling ceiling spotlights which sit beside the ventilation system. Air Diffusion's FlowBar can be seen running along the edge of the ceiling within the makeup store. The ceiling is also enhanced by Air Diffusion’s Louvre Faced Ceiling Diffusers. Its super slim depth, at just 47mm, means the diffusers blend in well alongside the spotlights and FlowBar, aiding the store’s polished finish. All louvre faced ceiling diffusers are manufactured using high-quality extruded aluminium sections with 14 different air patterns available to cater for a variety of room heights and requirements. The discreet, but effective FlowBar air distribution system has become a key part of the design for the revolutionary educational building that went on to win the RIBA North West Award 2016.